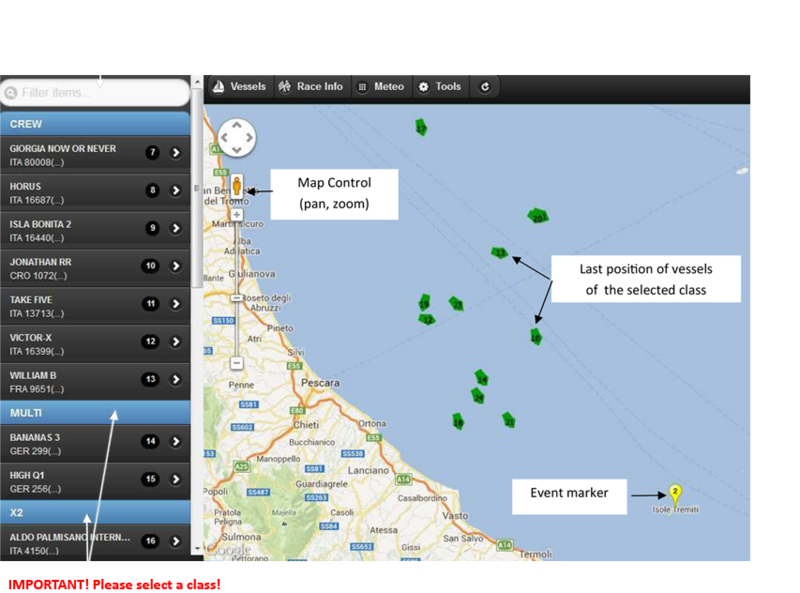 LiveTrack is a web based application designed to provide realtime tracking information and management of regatta events.  Tracking information is provided installing a compatible satellite device, like smartTrack, on each vessel. Livetrack requires a fast internet connection (ADSL+ ) and an updated browser : Mozilla Firefox (11+), Google Chrome (18+), Apple Safari( 5.1.2+) or Microsoft( Internet Explorer (9+). Livetrack has been tested on iPad and iPhone mobile devices and the majority of updated Android devices. For the best possible experience (resolution, details of tracks, multiple tracks) please use an updated PC hardware. The Livetrack main screen is shown in the following figure. Use the Boats command ("Vessel") to view the boat list and the fi lter to search by name. To allow easier presentation when many vessels are joining the same event, the application shows only the positions of vessel belonging to a selected class at once. At startup Livetrack selects and shows the first class in alphabetic order : the user can change class selecting the blue header on the vessel list. The user can also select single vessels belonging to different classes to make comparisons. Remember to select the desired class or vessels !! 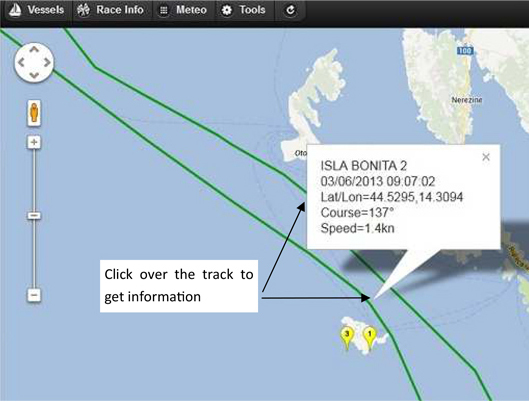 To show one or more vessel tracks please select (“click”) the name of the vessel or its number (the “bubble”). Livetrack will assign automatically a colour and display its track. Adding many tracks at time may slow down performance on mobile devices or old PC hardware. Update browser for more speed !! Selecting and already activated track will remove it. Track selection is independent on class selection : it is possible to select vessels from different classes for comparison. If you select (“click”) over a track a popup will appear with information of the closest track point . Selecting the “Rank” button the application will show a provisional rank, divided in three sections. In “Navigation” vessels are ordered by class and distance to arrival waypoint. In “Arrived” vessels are ordered by class and transit time of arrival waypoint. Please note that arrival time is estimated by the application based on proximity and transit range and is often corrected later by the organization. The third list show vessel that doesn’t compete (DNC) or have not finished the regatta (DNF). Selecting the “Meteo” button the application opens a new panel where the user can activate a meteo image overlay choosing among : none, wind at 10m, wave height , wave period and wind gust. Please use the legend image below the selection to evaluate the forecast colours and symbols. Forecast date/time can be selected using a drop-down menu up to the next 5 days. Meteo forecast is currently not available on some mobile devices.atili. 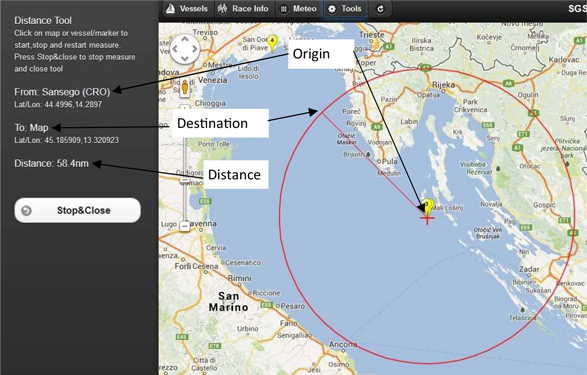 Selecting the “Tools” button the application opens a new panel that is useful to measure distance between two points : vessels, markers or generic point in map. The first click marks the point as origin and activates the distance tool : moving the cursor over the map will update current distance and destination on the left panel. The second click marks the destination point. Please click again to restart measure with the current position as new origin. Distance tools stays active until the “Stop and Close” button is pressed, even if the panel is hidden. Playback is automatically started pressing the playback button : the first vessels may be visible only a(er a few moments depending on actual start date/time. It is possible to add or remove vessels on the playback using the “vessel” panel and selecting the name or number of the vessel. The playback can be suspended selecting “stop” in the playback speed selection radio group : while being stopped it is also possible to change playback date/time manually using the slider control. It is also possible to review information selecting a point of the track or the vessel frame itself, exactly as it has been possible during real time. Pressing the “Restart” button the playback will be run again from beginning of event.